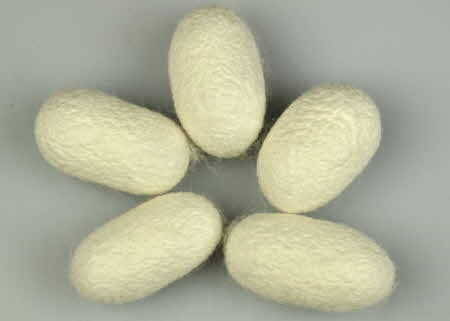 There are many reasons to buy white mulberry silk cocoons. They are interesting and you will enjoy shaking them to hear them rattle. They are good for biology lessons, as you can cut them up to see the pupa of silkworm inside. Alternatively you can put them to various craft uses. If you are keen you can learn to reel a continuous strand of silk nearly a kilometre long. Or you can stretch them on a wooden frame to make your own silk hankies. As they contain sericin you can combine them with carded cocoon stripping to make silk paper.